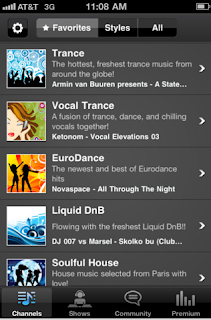 Developer Quote: "Digitally Imported streams the world’s most addictive electronic music." 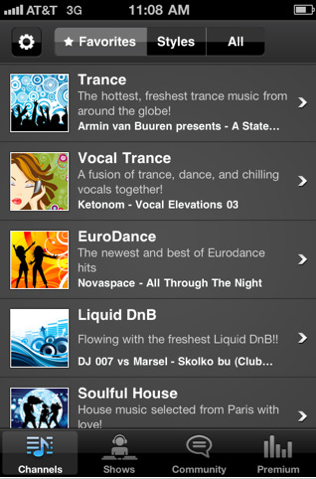 - View current and upcoming exclusive radio shows on Digitally Imported. - Optional buffer bar with data usage display to track data plan usage and signal issues. - Optional instant in-app upgrade to Premium to switch to higher audio quality with commercial-free streams. Try the free Premium trial within the app. What I like about Digitally Imported is its quick buffering. I truly dislike watching videos or listening to music which stops for seconds or minutes at a time to buffer. You get smooth music play here along with excellent sound quality. Listen to some great shows by cool DJ's, as well as connect with Facebook and Twitter. Yes, there are ads in this version, but you can upgrade if you like what you see (or hear) to get ad-free streaming. Use other apps on your device, and keep your favorite music playing in the background without missing a beat! COOL CONCLUSION:: "Digitally Imported gets a thumbs-up for a well put-together, clear, sharp electronic, music app with tons of station choices." --Tip/Tutorials: Some of the useful updates in this version are: Faster load time, an improved data counter for large quantities and 256K MP3 option in settings for Premium users. --Developer Link: Audio Addict, Inc.